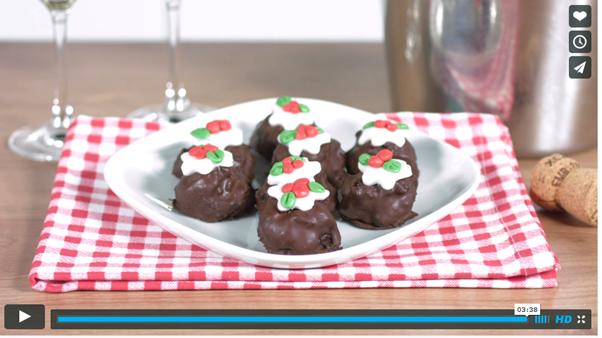 The first in the series are these Mini Chocolate Christmas Pudding Bites. Perfect little after-dinner and party treats, they are also a very delicious way of using up any leftover Christmas Pudding this festive season. 5. Using a pair of disposable vinyl gloves roll small lumps of mixture into balls, approximately 1 inch in diameter and place on the prepared baking tray. 8. Using a small daisy flower cutter, cut out the ‘brandy sauce’ decoration, one per pudding bite. Place on top of each bite. Form three small ‘berries’ for each bite from the red fondant and two ‘holly leaves’ per bite from the green fondant and use to decorate. The videos were produced in association with Argos, who have a great range of larder fridges such as the one seen in this film. Pop back shortly for the second film in the series. Yum! I feel so Christmassy now! I think I'd much prefer a plate of these to the more the usual dollop of Christmas pudding. Especially with a small glass of wine. Loving the early Christmas theme!